Okay, don't be mislead by the word 'Walnut' here. It DOES NOT contain any walnut. Only flour, sugar, oil and a little of alkaline water and butter to make this crunchy~licious Hup Tou Soh. Don't believe, right? I too, was skeptical about this recipe. "How can a Hup Tou Soh not containing any walnut? Then how come it tasted like walnut cookies? Where does the flavor comes from?" I have so many questions up in my head and I turned to Kimmy from Cooking Pleasure for answers. 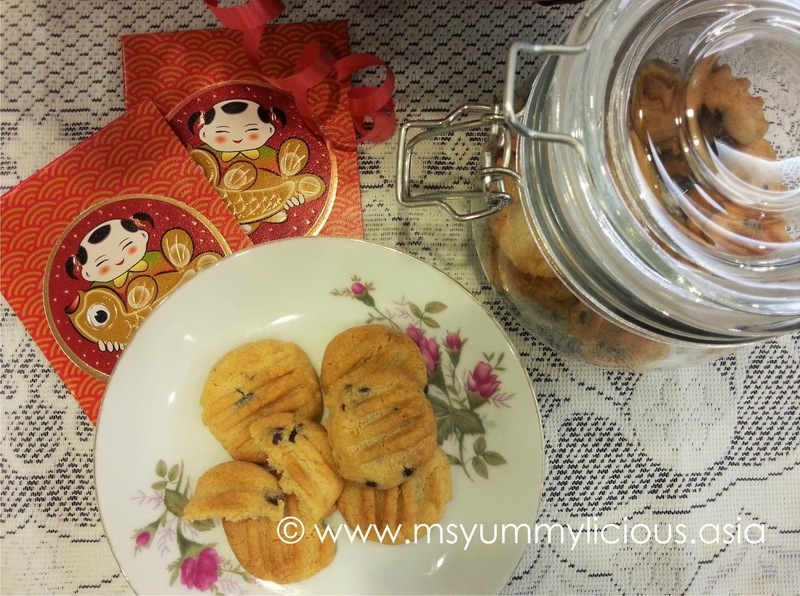 Kimmy has just baked her Hup Tou Soh cookies recently and she has also baked Hup Tou Soh cookies WITH walnuts before, so she is the perfect person to ask. According to Kimmy, this version is better and she has no regret baking them. After hearing her, I was more confident to try this recipe. Indeed, she was right! 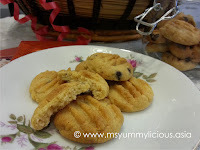 These cookies are superb in taste and texture wise. I love that I can have the saltiness in between the sweetness in each bite. And these cookies are really crunchy. However, if I were to compared with the Hup Tou Soh I had before, these cookies are lacking of the walnut flavor (for the obvious reason). 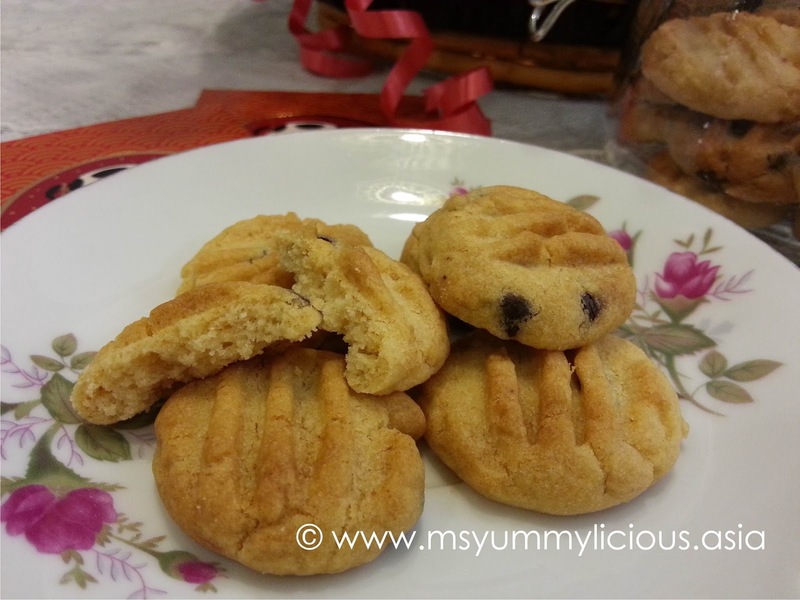 But definitely I have no regret baking these crunchy~licious Hup Tou Soh for it only took a few simple ingredients for these yummy cookies. And by accident (because I needed to attend to my 6 months old crying son), I found out that if I let the dough rest longer, around an hour more, the cookies will expand even bigger after baking. Texture wise remained the same. Please refer to the photo above for comparison. 1. In a mixing bowl, mix in flour, baking powder, sugar and salt. Add in alkaline water and stir well. 2. Using a spatula, press the butter against the flour mixture (repeatedly), till crumbly. In a slow stream, add in the oil whilst stirring to combine. You will have a slightly wet crumbly dough. Using your hand, knead it together and leave aside, covered with tea towel to rest at least 30 mins. 3. Preheat oven at 170°C. 4. Roughly shape the dough into small balls and slightly flatten with your palm to form a thick disc. Place them on a baking tray. 5. Using a suitable bottle cap (I used an empty thread spool), press to form a circle in the center of each cookie. 6. Glaze with egg wash and bake for 25 mins or until golden brown. 7. Leave to cool completely on wire rack before transferring to airtight container. ● The longer you let the cookie dough rest, the more it will expand during baking. 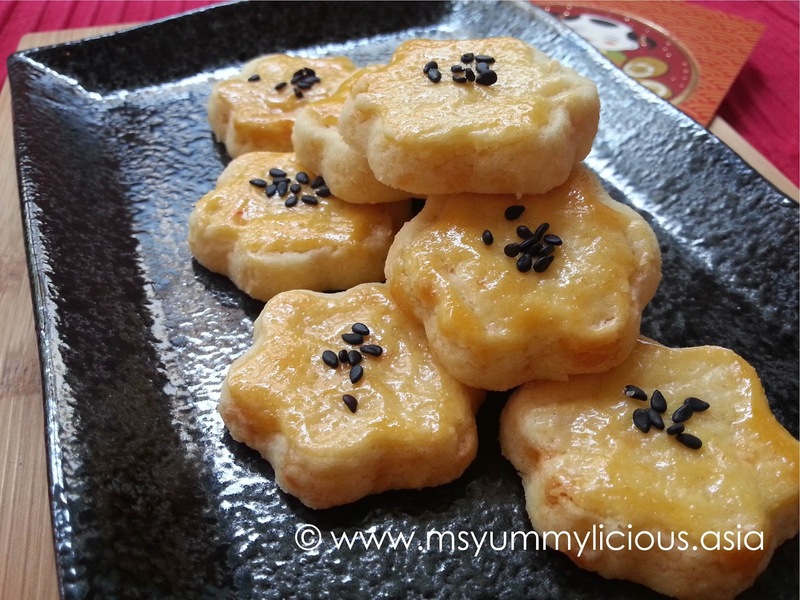 While I was blog hopping last week, I stumbled across Zoe's Melt-in-your-mouth Salted Egg Yolk Cookies. Her cookies looks really cute and what makes me wanting to bake this too are her words ~ "Sweet, buttery, a little salty and melty... Every mouthful of these salted egg yolk custard-like cookies are so yum". Ah.. so yummy just at these words right! Well, I did not wait too long to bake these yummy~licious cookies. Had it baked two days ago with my almost 3 years old daughter. We both had so much fun. We did the whisking together, I did the mixing and rolling, and then I let her do the rest - cutting, glazing and sprinkling of black sesame seeds. She's a quick learner, I only needed to show her how to do it once. These cookies are really light. 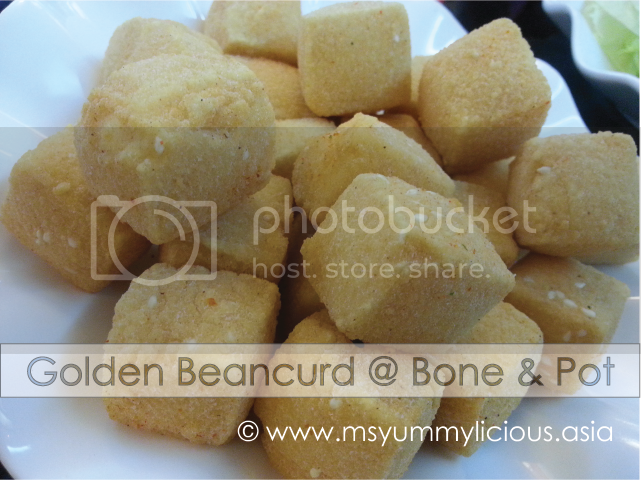 It has a mild flavor of salted egg yolk, buttery taste and mildly sweet. All the flavors are equally balanced without overpowering one another. 1. Using a hand whisk (or electric mixer), cream butter and sugar until pale. Sift flour, corn flour and baking powder into the butter mixture and mix well using a spatula until all ingredients are well incorporated. 2. Then sprinkle in the mashed salted egg yolks and mix thoroughly, making sure the salted egg yolks are evenly distributed. Wrap dough with cling wrap and leave to rest in the fridge for 30 mins. 3. Preheat oven at 170°C. Line your tray with a baking paper. 4. Using 2 sheets of grease-proof paper, sandwich the dough in between and roll out until about 3mm thick. Cut out shapes using your desired cookie cutter and arrange them on the prepared baking tray. 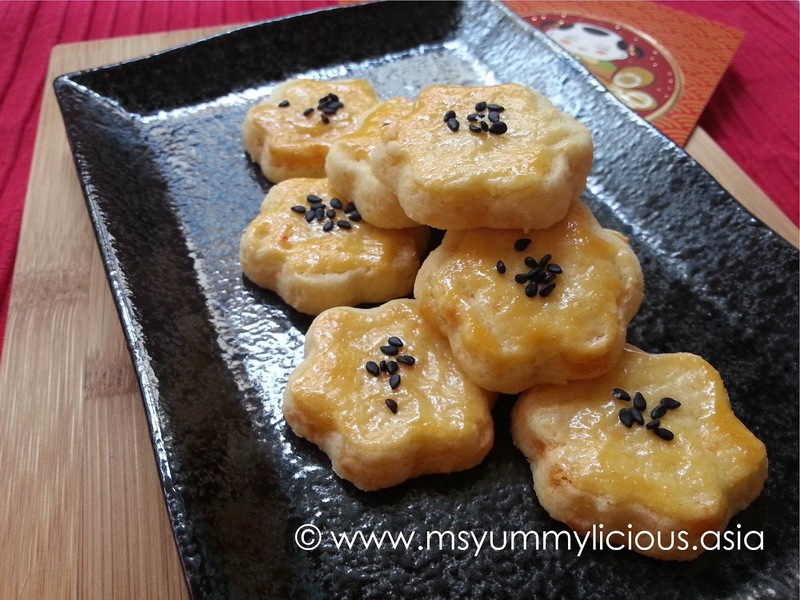 Glaze cookies with egg yolk and sprinkle some sesame seeds on it. 5. Bake for 15 mins or until golden brown. Leave cookies to cool on baking tray for at least 10 mins before transferring them on wire rack to cool completely. ● To cook the salted egg yolks, steam them over hot bubbling water for a few minutes, approx 5 mins. 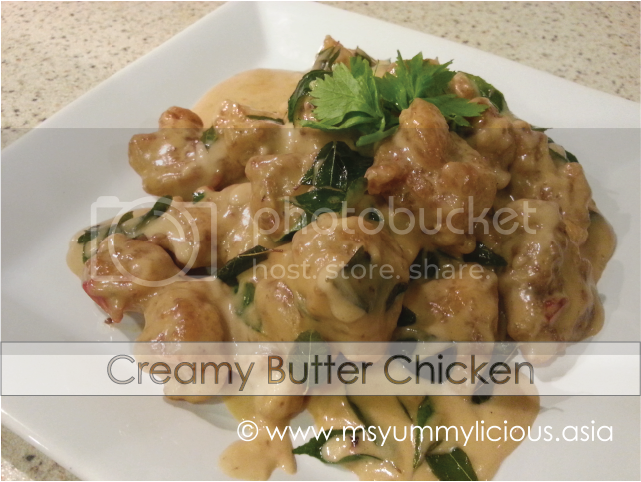 ● In Step 2, if there are chunks of salted egg yolk, break them using your spatula as you mix. Bak Kwa is a salty-sweet dried meat produce similar to jerky. It is originated from Fujian province in China by the Hokkien society. I used to remember we only get to eat Bak Kwa during Chinese New Year. But nowadays, you can enjoy this Hokkien delicacy all year through, thanks to the shops specialize in selling Bak Kwa. 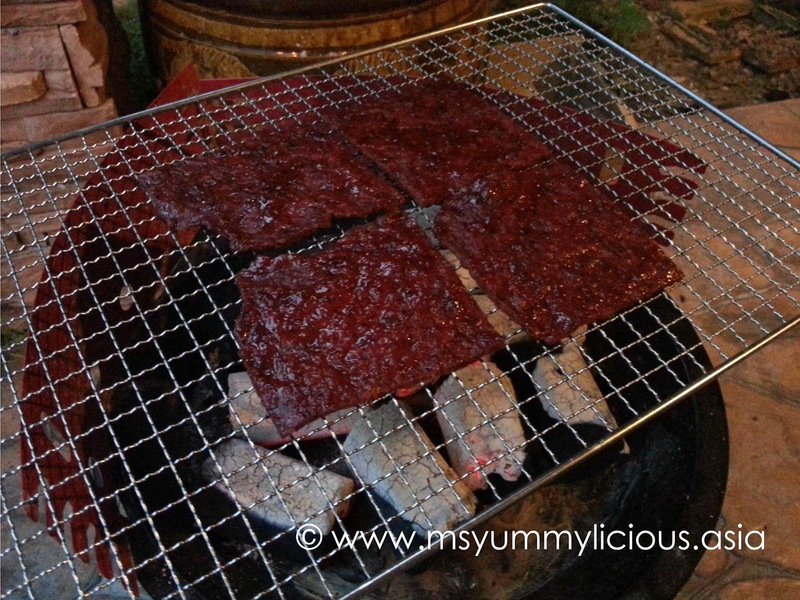 I have never thought of making Bak Kwa myself until i saw many mommies in DHM group successfully making these Bak Kwa. They are truly inspirational! I am so glad I've joined this group just in time for CNY. 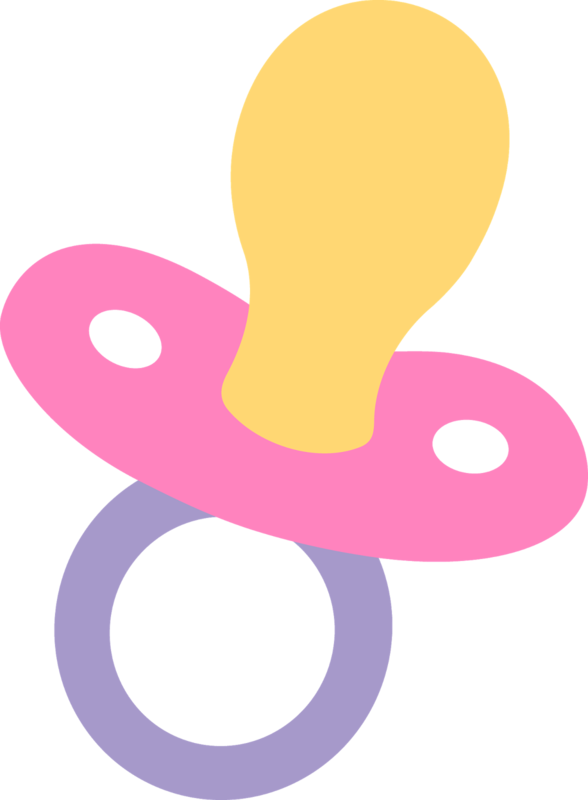 Thank you, VL for creating this group, and thank you mommies for inspiring me! A special thanks to Mommy Yen and Mommy Nidz for mentioning about red yeast rice as food colouring. You ladies ROCKS! For the meat and fat ratio, I've tried on a few and I would say the best ratio would be 80% meat and 20% fat. The fat is essential to keep the meat juicy during baking and grilling. It will also flavor the meat with the lard rendered through the cooking process. The recipe is adapted from Malaysian Chinese Kitchen and I make changes to it to get to the closest taste of those commercial ones. (I am still finding tune to the EXACT taste but right now, I am confidence to publish this recipe for those who likes homemade taste. It has at least 80% similarity to the commercial ones) And of course, the final grilling must be over the charcoal to get the optimum char flavor. With the economy so bad and the pricing of Bak Kwa increasing each year, it is a brilliant idea to DIY at home. What's more when it is not that complicated as I thought it would be. 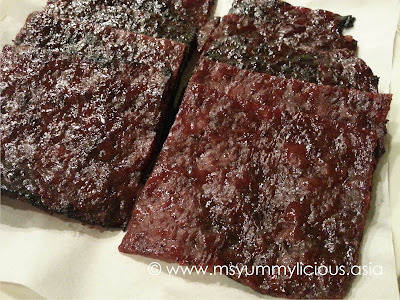 I am definitely (DEFINITELY) making another batch (or batches) of these juicy~licious Bak Kwa again soon. 1. In a large bowl, combine all ingredients and mix well until it turns gooey, approx. 2 mins. Cover and leave to marinate in the fridge for 4 hours or overnight. 2. Prepare 2 sheets of parchment paper the size of your baking tray. 3. Using a butter knife, spread a thin layer of meat mixture onto parchment paper, leaving about an inch around the paper clear of meat for easy handling. The meat layer should be around 3mm thick. 4. Cover the meat with a cling wrap. Using a rolling pin, slightly roll over the meat to even out the meat. The meat layer should be around 2mm thick. Repeat step 3 & 4 until all meat is used up. 5. Transfer the sheets of meat to baking tray and bake for 15 mins at 120°C. 6. Leave to cool on the tray until it it cool to handle, approx 5 mins. Using a pizza cutter, cut each sheet of meat into 6 pieces or your desired size. 7. 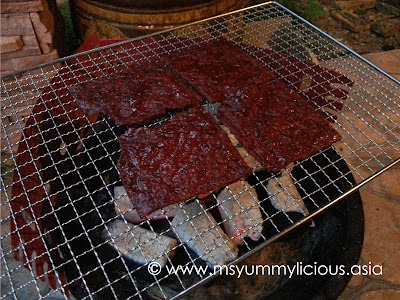 Grill the slices of meat over prepared BBQ stove, flipping constantly until you get your desired char look. You will need to coordinate the timing with your eyes as the meat will burns easily. 8. Leave to cool completely before storing. When grilling over charcoal is not able, you may grill in oven. 7. Grill the slices of meat at 220°C for 5 mins. You will need to coordinate the timing with your eyes as the meat will burns easily. 8. After 5 mins, remove from oven and flip the slices of meat over. Return back to oven for another 5 mins. Leave to cool completely before storing. 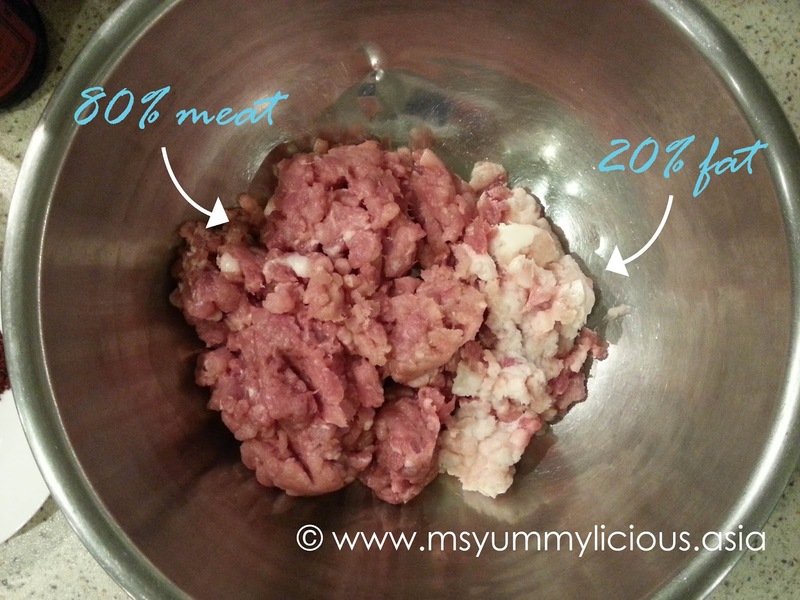 ● DO NOT use your hand to mix the meat mixture as the bacteria in your hand will turns the meat mixture bad. Instead use a metal spoon or spatula. It's cookies again in my kitchen! 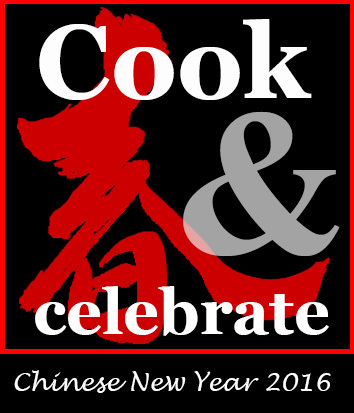 I am going to continue baking cookies until Chinese New Year. 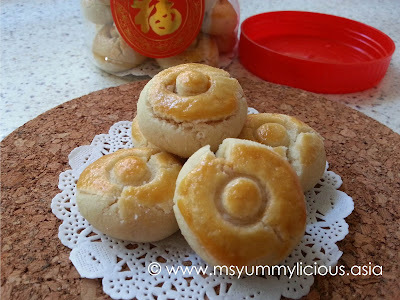 Hopefully I will be able to complete my long list of interesting CNY cookies that I wanted to bake. I got to keep the momentum going or else i'll just procrastinate. I can't let the lazy bug to stop me again (this year)! 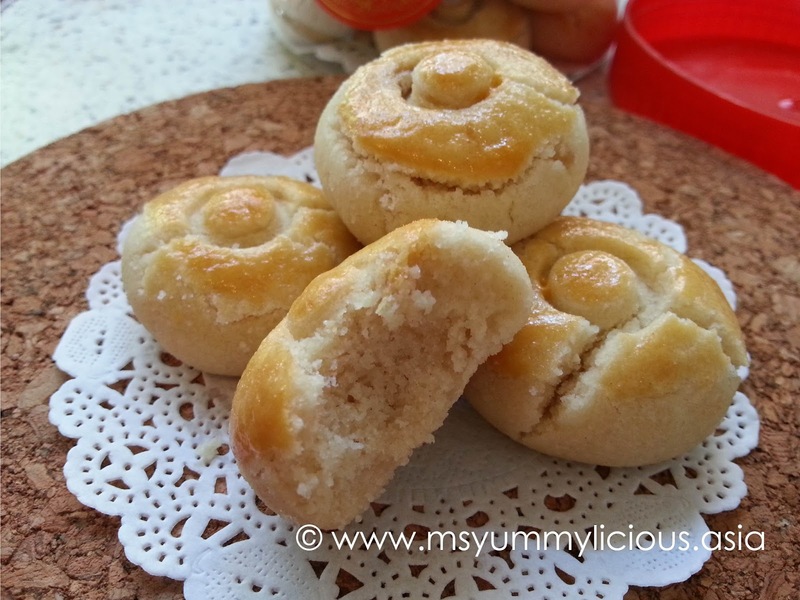 So here is it, Today's Baked ~ the famous Melt In Your Mouth German Cookies. 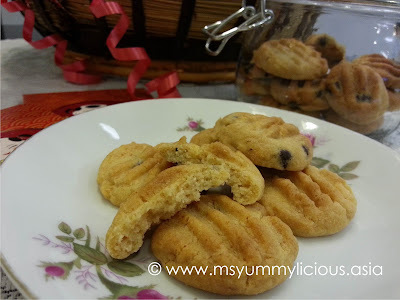 If you have been blog hopping or active in FB food groups, you will know that this cookies are very light and crumbly. It is very delicate and must be handle with extra care before bake. 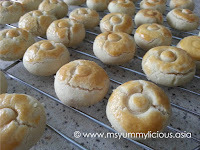 When I was googling for the recipe, it was easy to choose which recipe to adapt because all the recipes are the same and they linked back to Min's blog. Just when I was about to conclude my search, I stumbled upon Ann's Chocolate Marbled Cookies. They were gorgeous! I love the marbled effect on the cookies and hence decided to adapt her recipe. 1. Preheat oven at 170°C. Line your tray with a grease-proof paper or greased with butter. 2. Cream butter and icing sugar until pale. Add in potato starch and vanilla extract, and mix well. 3. Divide the dough into two equal portions. Fold in 40g plain flour to one portion until well combined and in another portion, fold in 30g plain flour and cocoa powder. 4. 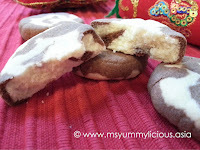 To shape the cookie : Roll plain dough and chocolate dough into long strips. Combine them together alongside each others and swirl them around. Flatten with your fingers and placed on the prepared tray. 5. 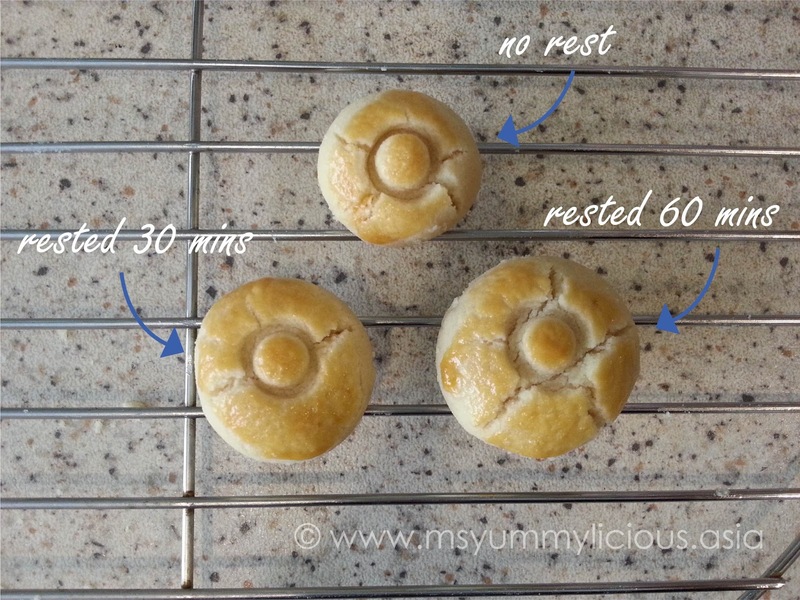 Bake for 20 mins. 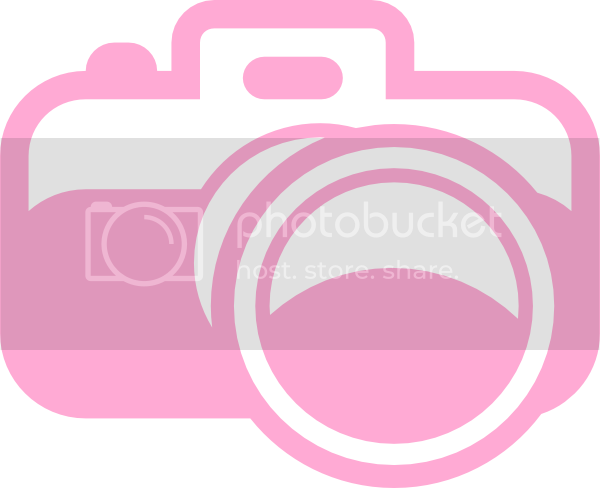 Leave to cool completely before storing in an airtight jar. ● To divide the dough equally in Step 3, weight the dough first and divide accordingly. 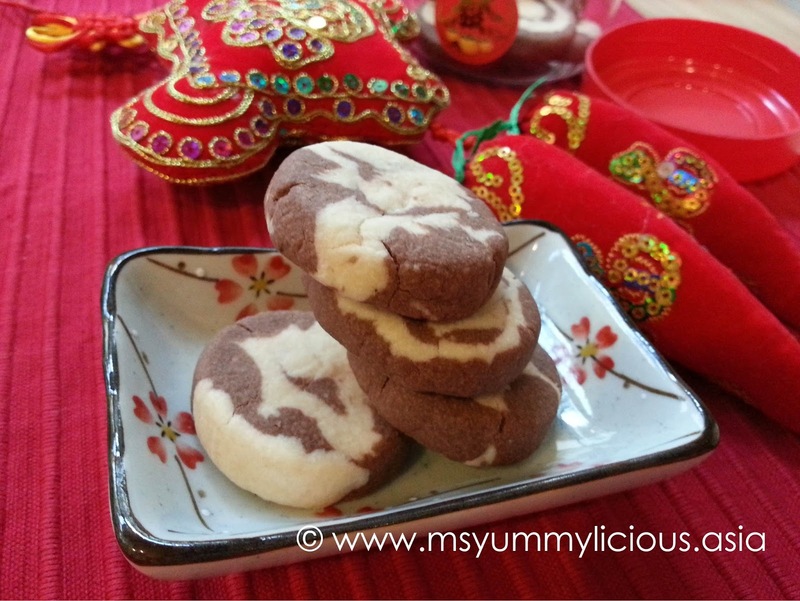 With the Chinese New Year approaching, it is hard not to bake some cookies in my kitchen. Since I've been wanting to try out this golden syrup cookies recipe, now is the perfect time. I've made some tweaks in the original recipe to suit my family's palate. The result is a batch of yummy~licious cookies! 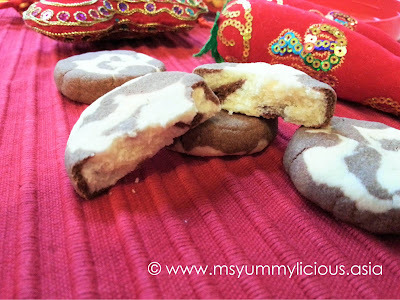 These cookies are super addictive! My almost-3-years old daughter couldn't stop taking the cookies while it was still cooling on the wire rack. And now (just after one night), I only have 7 pieces left in the jar. My hubby gave me a rating 9 out of 10! While I was working on this dough, I thought, "Will it be better if I add some peanut butter?" So, I tried adding about 2 heaps tablespoons of peanut butter with the last quarter of my cookie dough and mixed it till it was well combined. The dough became softer and the baked cookies were yummylicious. It has the 'melt-in-your-mouth' texture and the three of us (my hubby, daughter and I) gobbled up all 12 pieces in no time (hence there is no photo of it). My hubby gave me a rating 10 out of 10! 1. Preheat oven at 180°C. Line your tray with a grease-proof paper or greased with butter. 2. Using a hand mixer (or hand whisk), cream butter and sugar until pale. Then add in golden syrup and whisk till combined. 3. In three bacthes, add in flour and whisk until well incorporated. Fold in chocolate chips. 4. Using two teaspoons, form small balls and place on the prepared tray. 5. Bake at 180°C for 12 minutes or until golden brown. 6. 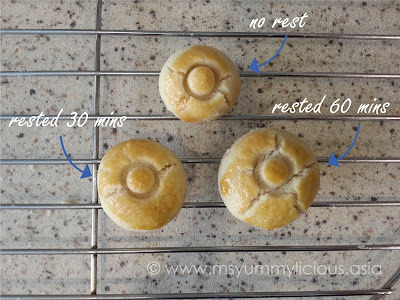 Allow to cool on the tray for 3 - 5 mins before placing them to cool completely on wire rack. ● If you want to have both versions, you may split the dough into half and add 4 tablespoons of peanut butter.